Silatech, a regional social initiative, and the International Youth Foundation (IYF), a global youth development organization, are jointly announcing plans to hold a three-day conference designed to develop and implement solutions to the region’s growing youth unemployment crisis. The event, “Arab Youth Employment: Promoting Innovative Solutions to Longstanding Challenges,” is expected to draw over 350 delegates from throughout the Arab world, including representatives from leading NGOs and civil society organizations, policymakers, leaders from the private sector, researchers and the media to share insights and build effective partnerships to support Arab youth employment. Youth unemployment in the Arab countries is the highest of any region in the world, and is growing. The jobless rate among Arab youth has increased from 24% in 2009 to 29% in 2014, while entrepreneurship has declined over the same period. Organized by Silatech and hosted by IYF, the conference will be held at the Landmark Amman Hotel in Amman from April 28-30, 2015. This year’s event builds upon the success of the 2013 “Arab Youth & Entrepreneurship” conference in Doha, which brought together delegates from throughout the region to enhance youth entrepreneurship and economic opportunities at the grassroots level. The conference itself is innovative in its approach, with a crowd-sourced agenda that features 18 sessions that are being organized by over 20 contributing partners – leading youth-serving organizations from across the region and the world. The content will showcase the rich knowledge and innovative approaches that are being developed throughout the region. The contributing partners organizing sessions at the conference include the World Bank, the International Labor Organization, Oasis 500, Tamweelcom, Mowgli, Save the Children, United Nations Development Programme (UNDP), the Abdul Latif Jameel Poverty Action Lab, Ahead of the Curve, and the RAND Corporation. Silatech is a regional social initiative that works with partners throughout the Arab world to create jobs and expand economic opportunities for young people. The International Youth Foundation (IYF), founded in 1990, is a global leader in youth development focused on education, employment, and citizenship. 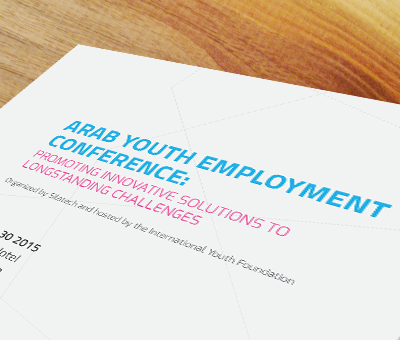 For more information on the “Arab Youth Employment” conference, see www.aye2015.org.